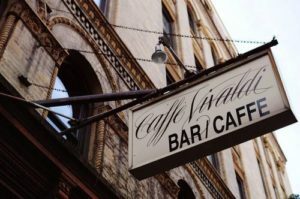 The legendary CAFFE VIVALDI is closing. I played my very first concert at Caffe Vivaldi. In 2005, I was about to graduate NYU and I was trying to find a location to present something like a senior recital, somewhere I could celebrate the culmination of my music studies. There was no place available on campus. Of all the real estate NYU owned in the city (and it owned the most — second only to the Catholic Church), i did not have access to it. 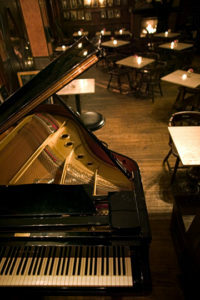 My college advisor, guitarist Bill Raynor, suggested a little venue in the west village where he performed regularly. Though I had been in NYC four years, I had never been there. But it had a grand piano, a cool classy vibe, and I could put on whatever kind of show I wanted. Ishrat Ansari, the owner, took a chance on me and gave me 2 prime weekend slots, a Friday evening and a Saturday afternoon. As I stepped up to the mic to thank a room full of all my friends and family for attending my 2nd and final show, Ishrat came up behind me – though we had never met – and over my shoulder told me to invite the crowd to my next show. “But I don’t have one.” “Sure you do. Tell them to come back next month for your next show at Caffe Vivaldi.” and that’s how I got my second gig. 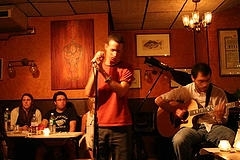 Over the next few years, Caffe Vivaldi was the place i experimented with my songwriting and got experience performing. Caffe Vivaldi was the place i could bring on different musicians, build a band and a repertoire, and invite friends and special guests to sing with me. i got to perform on my own terms and figure out the kind of music i wanted to make. i got to play a beautiful grand piano by a fireplace and eat great cheesecake and discover how many glasses of wine it took before my stage banter became incoherent (three). Caffe Vivaldi always opened its doors to me and gave me a chance. It gave me a chance to pursue a career making music, and I don’t know where I would be without it. Vivaldi never had the industry reputation of a venue like Rockwood Music Hall, though they were roughly the same size. 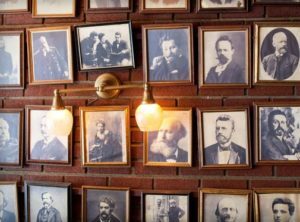 But this ensured that Caffe Vivaldi remained one of the rarest of places in the city – a place you could reliably go any night of the week and hear live acoustic music in an intimate setting for no cover, no matter how old you were. I will always remember the Caffe Vivaldi open mic as one of my favorites. 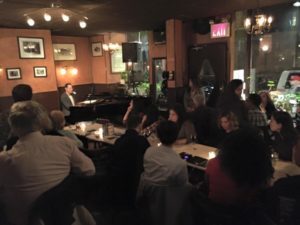 The level of talent that showcased there raised the bar for other songwriter open mics, and the community that gathered there always felt familial – which was also a really unusual feeling to feel in New York. and it was all by design. In 2012, one of my best friends from college died suddenly and unexpectedly at the age of 28. He passed away at home in Texas and many of us in NYC were unable to attend the funeral. But we wanted to remember him and celebrate him. Once again, Caffe Vivaldi opened its doors. For one Friday evening, the entire establishment was ours. We were given a place to grieve and remember our friend from the chairs and bar stools where he had once sat, to tell stories and laugh across tables where he had laughed, to sing and play the piano where he had once listened and cheered us on. That night, Caffe Vivaldi was there for us, no questions asked. I will never forget that bit of kindness. There are ghosts at Caffe Vivaldi. It’s not just the ghosts of the composers whose framed pictures line the walls. It’s the ghosts of the notes that were played and the songs that were first performed there. You can feel it reverberate in the creaky wood floor. When Vivaldi closes its doors for the last time at the end of this month, New York will be losing a member of the family, a dear friend, and a little bit of its soul. We may not be able to find another place like it. But I hope we try. Thank you to all the musicians who have played with me at Vivaldi over the years, all the songwriter friends I have made, all the people who came and sang along in the caffe. If you have any photos from my shows at Vivaldi or favorite memories there, feel free to share them here. And finally, thank you to Ishrat & the Ansari Family. Read more about Caffe Vivaldi’s closing HERE. Posted Saturday, June 2nd, 2018 under Uncategorized.